1Laboratory of Pharmaceutical Research and Development of FARMAKA TROPIS, Faculty of Pharmacy, Mulawarman University, Samarinda, East Kalimantan, INDONESIA. 2Laboratory of Pharmacognosy- Phytochemistry, Faculty of Pharmacy, Universitas Indonesia, Depok, West Java, INDONESIA. 3Laboratory of Pharmaceutics, Faculty of Pharmacy, Universitas Indonesia, Depok, West Java, INDONESIA. Objective: Trans-resveratrol is a phenolic compound in the stilbene group present in Melinjo (Gnetum gnemon L.) seeds. In Indonesia, these seeds are consumed by roasting, frying (i.e., emping), and boiling. This study aimed to evaluate the effects of food processing on trans-resveratrol and total phenolic compound levels in melinjo seeds. Methods: Melinjo seed was roasted at 145oC for 10 and 20 min, boiled at 100oC for 5, 15, and 30 min, and fried at 160-170oC for 2 and 4 min. Samples were refluxed with 96% ethanol. The determination of trans-resveratrol levels was performed using high-performance liquid chromatography (HPLC), and total phenolic content was determined using Folin-Ciocalteu method. Results: Based on the results, it was found that trans-resveratrol and total phenolic content levels in Melinjo powder decreased from 36% to 10% (trans-resveratrol) and 15% to 4% (total phenolic) after 20 min of roasting, and in fried empings, it decreased 60%, 68%, and 92% (trans-resveratrol) and 41%, 45%, 97% (total phenolic) after 5, 15, and 30 min of boiling, respectively. 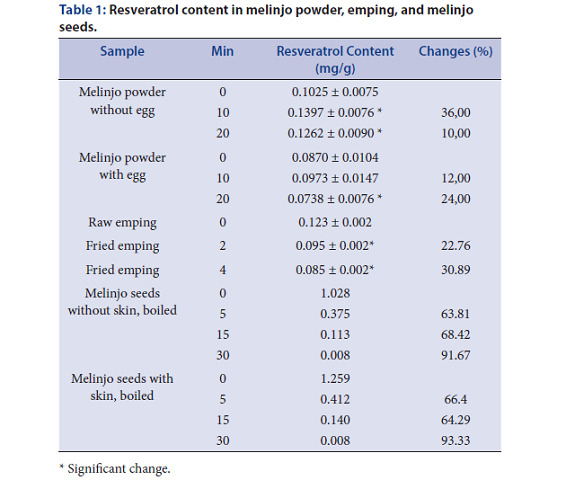 Conclusion: There were significant changes in trans-resveratrol levels and total phenolic content in Melinjo seeds before and after various cooking processes (i.e., roasting, boiling, and frying). Ahmad I, Andriyani D, Gunawan C, Fauziah ND, Sutriyo S, Mun’im A. Effects of Food Processing on Resveratrol and Total Phenolic Content in Melinjo (Gnetum gnemon L.) Seeds. Pharmacognosy Journal. 2018;10(6):1096-1100.